Jack Youngblood (Los Angeles Rams) autographed mini helmet. All autographs are 100% guaranteed and this item comes with a certificate of authenticity from Tri Star. Drew Bledsoe (Dallas Cowboys) autographed mini helmet. All autographs are 100% guaranteed and come with a certificate of authenticity from www.RKSportsPromotions.com. Bill Bergey (Cincinnati Bengals) autographed mini helmet. All autographs are 100% guaranteed and come with a certificate of authenticity from www.RKSportsPromotions.com. Harold Carmichael (Philadelphia Eagles) autographed mini helmet. All autographs are 100% guaranteed and come with a certificate of authenticity from www.rksportspromotions.com. Gino Marchetti (Baltimore Colts - Hall Of Famer) autographed mini Colts throwback helmet. All autographs are 100% guaranteed and come with a certificate of authenticity from www.rksportspromotions.com. Gino Marchetti (Baltimore Colts - Hall Of Famer) autographed mini Colts helmet. All autographs are 100% guaranteed and come with a certificate of authenticity from www.rksportspromotions.com. Justin Pugh (NY Giants 2013 #1 Draft Pick) autographed mini helmet. This item was obtained at his 1st ever signing on July 6, 2013 in Wildwood, NJ. All autographs are 100% guaranteed and come with a certificate of authenticity from www.rksportspromotions.com. Andre Gurode (Dallas Cowboys) autographed mini Cowboys helmet. All autographs are 100% guaranteed and come with a certificate of authenticity from www.rksportspromotions.com. 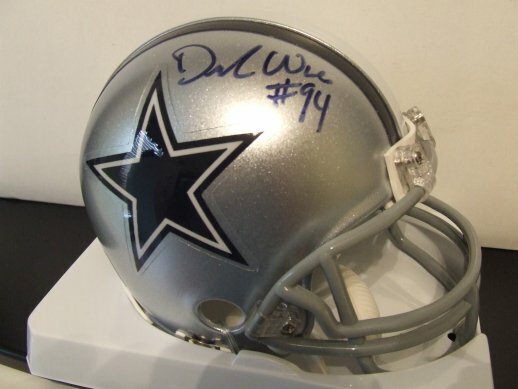 Kevin Williams (Dallas Cowboys) autographed mini Cowboys helmet. All autographs are 100% guaranteed and come with a certificate of authenticity from www.rksportspromotions.com. Dallas Cowboys autographed full size Riddell replica helmet. This helmet contains 14 signatures which include: Jason Garrett, Orlando Scandrick, Ken Hamlin, Andre Gurode, Montrae Holland, Martellus Bennett, Dat Nguyen, Chris Canty, Stephen Bowen, Nick Folk, Keith Davis, Curtis Johnson, Kevin Ogletree & L.P. Ladouceur. All autographs are 100% guaranteed and come with a certificate of authenticity from www.rksportspromotions.com.